Japan’s cabinet has voted to buy over 100 extra F-35 stealth fighter jets. The cabinet of Japanese Prime Minister Shinzo Abe on December 18 approved an increase of Japan’s existing order for 42 fifth-generation Lightning II F-35A stealth fighter jets — the aircraft’s conventional takeoff and landing variant — to 147 of the aircraft as part of the National Defense Program Guidelines (NDPG), which set out Japan Self Defense Force (JSDF) capability targets over a period of about 10 years. Next to 63 extra F-35As, the new order will likely include around 42 F-35Bs, the U.S. Marine Corps’ short take-off and vertical landing (STOVL) variant of the aircraft. The F-35Bs are reportedly slated for service on Japanese-held islands skirting the East China Sea and aboard the Izumo-class helicopter carriers, which are expected to be converted into full-fledged aircraft carriers capable of launching F-35Bs in the next decade. The current NDPG and the fiscal 2019-2023 midterm defense buildup program outline an initial procurement of 27 F-35As and 18 F-35Bs over the next five years. Total acquisition costs for the additional 63 F-35As and 42 F-35Bs will likely exceed $10 billion. In January of this year, the Japan Air Self Defense Force (JASDF) deployed its first F-35A at Misawa Air Base in the northernmost part of Honshu. A total of ten F-35As are currently operationally deployed and the first JASDF squadron to be stood up in the coming months. 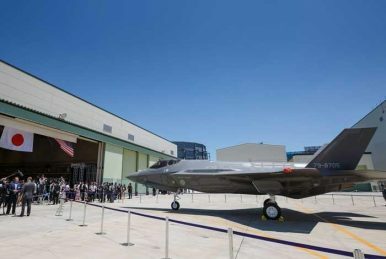 While the first batch of four F-35As were all built in the United States, the remaining F-35A aircraft currently on order are being assembled at the Mitsubishi Heavy Industries (MHI) F-35 Final Assembly and Check Out (FACO) facility in Nagoya. (The first F-35A built in Japan was rolled out in June 2017.) According to the Japanese MoD, the additional F-35s, however, will not be assembled in Nagoya and will be delivered in fly-away condition from the United States. The F-35B variant is around 20 percent more expensive than the F-35A, with an estimated $115.5 million per-unit price tag under Low-Rate Initial Production Lot 11 (LRIP 11). In comparison to the F-35A, the F-35B has a reduced combat radius and operational range. The STOVL variant also carries a reduced weapons payload in the comparison to the F-35A. Both JASDF F-35 variants will be armed with long-range stand-off missiles, including the precision-guided JSM (Joint Strike Missile), originally developed as an anti-ship missile, with a range of about 500 kilometers (310 miles). The JSM can be carried inside the F-35’s internal weapons bay. A U.S. F-35B conducted its first close air support strike in Afghanistan this September, marking the first combat debut of the STOVL variant.